Those first few days after your child is born are life changing. It’s as if your whole world has opened up and you’ve discovered that life wasn’t as bright or colorful before your baby entered the world. I want to capture what you’re feeling. I want to document the looks exchanged between mother, father and baby. Those are moments so precious. They say that a picture is worth a thousand words, but I contend that a picture is worth far more. A picture can allow you to relive a single moment for years to come – to feel again the awe, the emotion, the joy. My newborn sessions are a series of photographs taken of your newborn. Your session fee includes at least sixty minutes with the photographer. 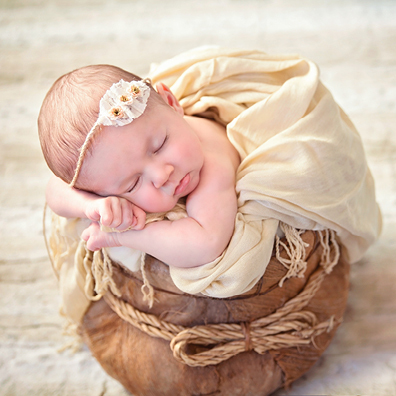 Newborn sessions generally take two to three hours. Please plan for as much time as needed to capture that perfect moment. These are the moments you want to forever remember. Your nonrefundable session fee is due at the point of booking and covers the artist’s time and talent as well and the listed product credit. One to two weeks after your session, an online gallery will be available to you and your family so that you may select your photographs and share your moments. For best posing and cooperation from baby, please book your session within the first 10 days of birth. I can certainly photograph your baby after that point, but won’t be able to offer the same variety of poses. Once you have booked your session, I will send you instructions for the day of the session. • Approximately 20 edited proofs, 40 viewing proofs.